Spider-Man: Homecoming is a new spin on the Spider-Man story and one that needed to be told. While it took a bit to process that we wouldn’t see some of the traditional elements of the original story in this version, the writers and directors did an amazing job re-creating Spider-man for the Millennial generation. Spider-Man: Homecoming is a reboot of the many versions of the Peter Parker/Spider-Man story we have all previously seen over the years. Instead of just taking the traditional story with Peter's uncle being killed and spinning a new version from there, the writers decided to show us what Peter went through trying to figure out his Spidey-powers- or rather, figure out his Spidey suit, compliments of Stark Enterprises and his newfound sponsor, Tony Stark. Sony has done an incredible job of re-creating Spider-Man for this new generation. Tom Holland (A Monster Calls) was first introduced as Peter Parker/Spider-Man in Captain America: Civil War. It was almost a shocker to see a very young and naïve Spider-Man as part of the Avengers, especially since this version of Spider-Man doesn't yet seem to have the cynicism that the prior actors seem to infuse into their character. Holland sees to have filled this iconic role beautifully and you soon get past the nagging feeling of missing something (this Peter's background has been almost ignored in the sense that we don't see how Peter becomes Spider-Man, only that he is Spider-Man.). Holland acts very much like a high school boy who clearly hasn't reached his peak of maturity in every sense of the character. Love-stricken, trying to follow the rules, it's almost adorable when he breaks them to do something he shouldn't- from playing with the Spidey suit when told not to be hiding things from Aunt Mae (Marissa Tomei; My Cousin Vinny) to having a hard time asking the girl of his dreams out on a date. Holland quickly grows on you as he is a believable actor and brings something new to the role of our favorite web spinner. He humanizes Spider-Man and the end result is that this smart kid knows he has a lot to learn before moving up to the big league, even when offered a once in a lifetime opportunity. Okay- we all know there will be a second in a lifetime chance but it's still a growing point for Peter Parker's character. A new character that we haven't previously seen entwined with Spider-Man as a central character is the beloved Tony Stark a.k.a. Iron Man (Robert Downey, Jr.; Iron Man). Downey, Jr. is- as always- simply Iron Man. He is direct and humorous at the same time, balancing out the young Peter with a more mature male figure. Stark is trying to train Peter through the use of the most amazing Spidey suit ever seen on the big screen, to date. The writers did an amazing job with the inclusion of all this technology that may not even exist yet, but clearly was a vision of Tony Stark, himself. Stark puts his assistant, Happy (Jon Favreau; Orville) in charge of Peter's training and although we all love Happy, he ignored most of Peter's phone calls and failed miserably in his supervision. Clearly, Stark is the missing father figure in Peter's life and even through an unmanned Iron Man suit, managed to pull Peter from situations that he may not have otherwise been pulled from. The main reason for purchasing this version of the many Blu-ray discs being release is for the 4K UHD, of course. Presented in 4K (2160p) resolution with a Codec of HEVC/H.265 and an aspect ratio of 2.40:1 (the original was 2.39:1) this version is exceptional. While Spider-Man's blue and red bodysuit usually pops in any version, the color intensity and depth in this version is eye-catching. I loved the whites and greys of the Washington Monument contrasted against the Spidey suit. No one color is glaringly over bright, rather the brightness of everything is in sync with each other. The 4K UHD brings a clearness and crispness to details that one will miss on a lesser pixel quality version. Fine details throughout the city that are slightly blurred or even faded into the background scenes on an HD Blu-ray, including the details in the webs made and the Iron Man suit that floats around berating Spider-Man, suddenly appear sharp in the same scenes on the 4K UHD. The color saturation and details really refine the actual movie, bringing the viewer a much more immersive viewing experience than another version. Audio is also upgraded for the 4K UHD Blu-ray disc to Dolby Atmos versus the Dolby TrueHD 7.1 provided on the HD Blu-ray that comes with this combo pack. The TrueHD 7.1 is an amazing auditory experience and the quality of the sound is exceptional but the Atmos just makes you feel like you are actually sitting in the middle of everything- and I say that from someone who does not have a surround system at home while viewing the movies for review. Web-slinging actually has a sound to it- did you ever notice that before? You can hear the sounds of the concrete falling on top of Peter. The whirring of the helicopter and crashing on the beach has a big impact with realistic sounds. Adding the Dolby Atmos to the 4K UHD experience makes you a part of the movie and not just an audience member. The Combo pack also offers over a dozen extras for viewers to enjoy. These include The Spidey Study Guide, Gag Reel, Deleted and Extended Scenes, A Tangled Web, Searing for Spider-Man, Spidey Stunts Aftermath, The Vulture Takes Flight, Jon Watts: Head of the Class, Pros, and Cons of Spider- Man, Rappin' With Cap, Photo Gallery and Trailer. While no one individual segment is very long they all combine to be an enjoyable montage of behinds the scenes footage an cast and crew interviews. Spider-Man: Homecoming is a new spin on the Spider-Man story and one that needed to be told. While it took a bit to process that we wouldn't see some of the traditional elements of the original story in this version, the writers and directors did an amazing job re-creating Spider-Man for the Millennial generation and even made sure that some of us from prior generations were just as interested as these tech kids. Congrats to Holland for bringing Spider-Man to life again. 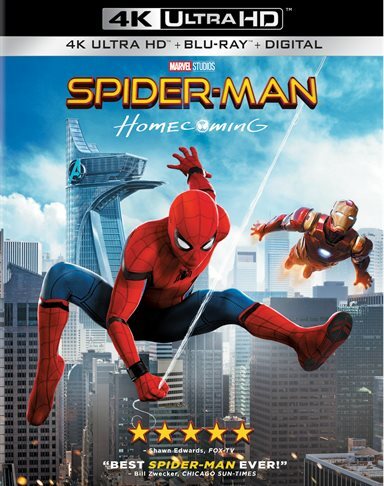 Download Spider-Man: Homecoming from the iTunes Store in Digial HD. For more information about Spider-Man: Homecoming visit the FlickDirect Movie Database.